SRAM Red Hydraulic discs and rim brakes: spy shots land! We told you it was coming, and here it is. Hot on the heels of the official SRAM Red launch at the very start of the month, we've managed to get our hands on some images of what we all suspected was coming: a SRAM Red hydraulic disc brake. 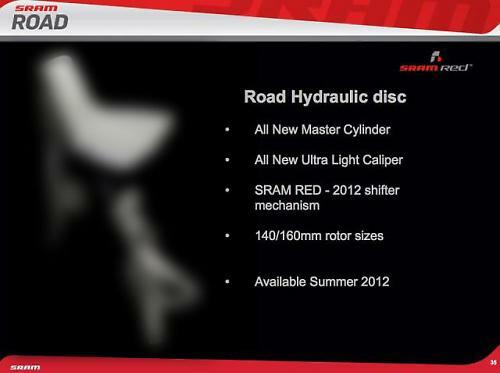 First pics of the hydraulic rim brake that SRAM had confirmed was in the line-up have also surfaced. If you came over yesterday you'll have seen the new kit in all its glory; today you'll have to make do with some esoteric blurred versions of the pics. Turns out the Red hydraulic disc and rim brakes were embargoed . Who knew? Not us, since we weren't at the launch and SRAM didn't let us know about the embargo. Ah well. Anyway, at the request of SRAM we've taken them down for now. If you want to see the original pics, your friendly local image search engine might be able to help. Let's start with the hydraulic rim brake. It's an interesting design, not least because SRAM have taken a very different route to Magura who unveiled their RT 8TT hydraulic brake at the Cervelo P5 launch last month. Whereas Magura approached the design of the brake very much from an aerodynamic point of view, the SRAM unit looks more or less like a standard road brake and we're guessing that the increase in power and suitability for eccentric cable routing is what they'll major on. We only have the one pic, but it looks like a side-mounted piston pusing a single-pivot mechanism, with a quick release lever on the brake unit and what looks like a mechanical barrel adjuster too. It's a simple-looking design and at a glance you wouldn't pick it apart from a cable operated brake. Tyre clearance is up to 28mm, and the brake is compatible with Zipp's wide-profile Firecrest aero wheels, so should take pretty much any width of road rim. 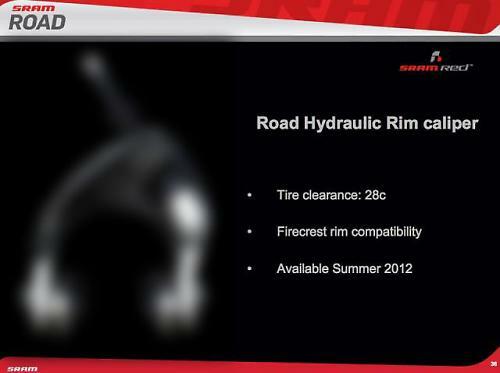 According to the pic it'll be available Summer 2012. So, soon. The disc brake is an 'All New Ultra Light Caliper' presumably knocked up with the bods at Avid which is part of SRAM. It's certainly a minimal design, although that won't save it from the inevitable 'monstrous carbuncle on the face of an old friend' complaints from traditionalists. Interestingly the SRAM spec is for 160mm front / 140mm rear rotors, where we'd been led to believe by our industry spies that the rotors might need to be bigger than that to cope with the heat generated by Alpine descents and such. We'll assume they know what they're doing. Again, Summer 2012 is the slated date for release. That's pretty much all the info we have right now, no word on weights, whether the brakes will be using Dot fluid or mineral oil, how powerful they are, whether the disc will require major re-engineering of the frame and fork, how much they'll cost… there are more questions than answers right now. But rest assured: road hydraulic rim brakes are already here, and road hydraulic discs are coming. Soon.